Indian Astrobiology Research Centre (IARC) conducts and encourages research in Astrobiology. The research goals of IARC are aligned with those determined by NASA in the Astrobiology Roadmap. Astrobiology is the study of the origin, evolution and distribution of life in the universe. It also refers to the search for any kind of life elsewhere, as well as the search for the elusive ET. To understand the origin of life and its evolution. To probe for extraterrestrial life, especially intelligent life. To understand the future of life on Earth and extraterrestrial life. 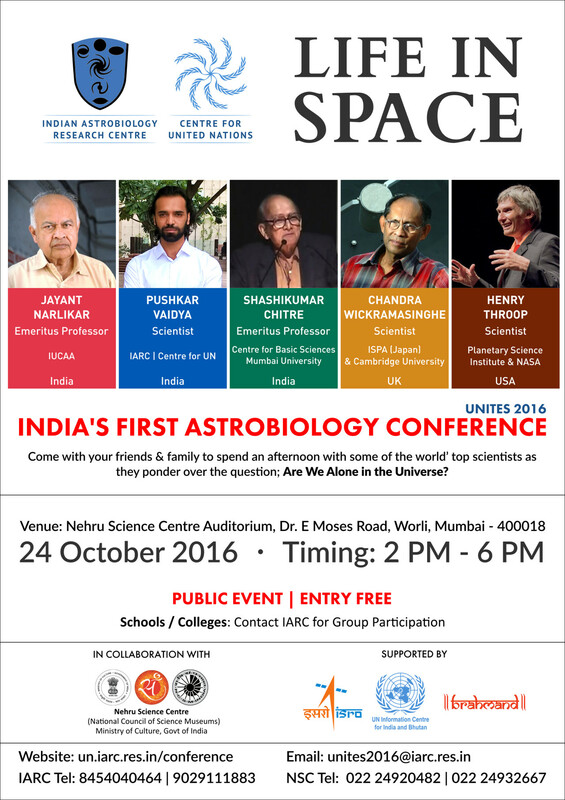 UNITES 2016 includes India’s first Astrobiology Conference. This special meeting will focus on select topics based on NASA Astrobiology Roadmap. Schools and Colleges: For Group Participation, please contact us on the above numbers. Registration for the Event Starts at 1 PM. Entry will be given on first come first serve basis.